Imagine if you are preparing for this season’s harvest and, overnight, the price of corn drops to $0.09 / bushel. Or soybeans to $0.22 / bushel. 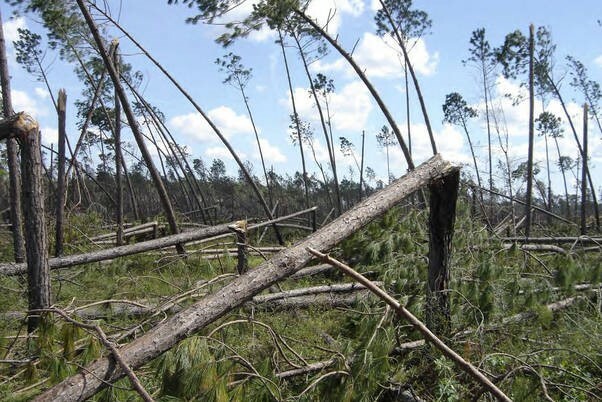 This is the harsh reality for timber landowners in the Southeast after Hurricane Michael. Trees worth $40/ton before the storm are now only bringing around $1/ton – and that’s if you’re lucky enough to get a salvage crew. The week of Hurricane Michael, our family was discussing possible timber contracts to harvest a portion of our mature pines for sawtimber. At the time, the prices for sawtimber were approximately $40/ton. After Hurricane Michael, we were praying we could get a crew in to salvage the trees for $1/ton as pulpwood. With over 5 million acres of timber damaged in Georgia and Florida – some a complete loss – we resolved to the reality that we may not be able to salvage any of our damaged timber. It was difficult enough to see our pines – both planted and natural – mangled, snapped, and uprooted. Not being able to salvage the wood for any purpose added insult to injury. We felt a sense of urgency to salvage. The condition of the downed trees, especially those with exposed roots, made the trees left standing susceptible to beetles and other diseases. If left on the ground too long, the trees develop a blue stain fungus or lose weight, decreasing an already depressed value. Thankfully, two months after the storm, a salvage crew moved in. We are extremely grateful to our foresters for their persistence in finding a crew to work with us. The Southeast simply does not have enough loggers and mills to deal with the influx of damaged timber from the storm. We are fortunate. Last week, we received a check for $159 for 159 tons of pulpwood. That was worth $6,360 before the storm. If we sell 1,000 tons, we will receive $1,000 instead of $40,000. Not all the timber we lost was sawtimber. Some of our mangled pines would have been classified as large poles, which are now priced at approximately $58/ton. To use the corn and soybeans comparison again, that would be similar to selling corn for $0.06/bushel and beans for $0.15/bushel. We are essentially giving away our timber in exchange for protecting the remaining trees. For those outside of agriculture, a similar comparison: you have a job making $40,000 per year. But at the end of the year, you find out you’ll only make $1,000 even though you’ve already worked the entire year. I share this to underscore the challenge timber landowners in the path of the storm now face. For some, the damaged timber was their retirement. Their insurance policy. Their backup plan. What do they do now? It takes 20-25 years to grow merchantable pine. We will not recover what we lost from the storm for decades. And no, we do not have insurance on our timber. Even if we did, it would still not make up for such substantial losses. I traveled to Panama City Beach, Florida for a meeting in mid-December. The drive was sobering and heartbreaking. The path I have taken my whole life to the coast is unrecognizable. The only damage I have ever witnessed that comes close to comparison is the aftermath of a tornado. Imagine a 200 mile-wide tornado. The trip gave me a wholly new perspective on the extent of Michael’s damage and the fury of its path. Our communities in Georgia and Florida need Federal disaster relief – now. This is only the story of timber for one landowner. Each farmer and agribusiness in the path of the storm has a similar, if not worse, narrative about the impacts of the storm. Pecans, cotton, poultry, peanuts, vegetables – we are all struggling after an unprecedented natural disaster. Our state leaders in Georgia have already taken steps to provide disaster relief, with the Governor convening a special legislative session in November. We are hopeful that our leadership at the national level will follow suit. When I wrote Land of the Pines a few months ago, I never dreamed what October 10th would entail. It is difficult to describe the sense of loss we feel, not only for our farm but also for the entire region. Hurricane Michael damaged nearly three million acres of trees in Florida, worth an estimated $1.3 billion. 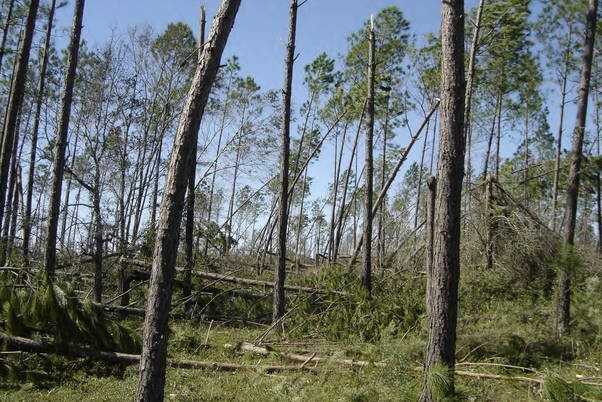 The Florida Forest Service assesses damage in three categories: catastrophic, severe and moderate. Here’s a breakdown of the storm’s destruction in each category. In Georgia, state officials say the lost timber is worth roughly $374 million. 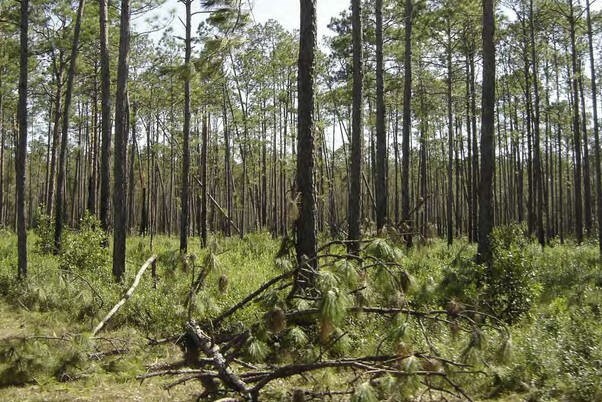 Forestry officials in Alabama are still tallying lost value, but have identified more than 42,000 acres of forestland in the state’s southeast corner where damage ranges from modest to total loss. Most owners simply have to salvage what wood they can while it is still worth something. Blue stain, brought about by fungi, can set in within about a month, and ruin saw logs. And it doesn’t take long for bugs and rot to take over. “It’s hard to get in and work when you have trees laying around like toothpicks,” said Marshall Thomas, president of F&W Forestry Services Inc., an Albany, Ga., firm that manages forests for landowners. Growers will be fortunate to salvage 20% of the damaged trees, and those that make it to mills might fetch just 20% to 50% of their pre-storm value, said Chad Nimmer, a Georgia lawmaker who works in logging. Bill Montford, a Florida state senator whose family owns 100 acres of devastated forestland, said even old trees that are left standing still suffered damage. “It’s questionable if you can use those from the damage inside,” he said. The condition of local mills is another concern. It isn’t economical to carry trees too far from where they are grown, with weight limits on highways, slim margins and in-demand logging crews who are reluctant to spend too much time on the road. WestRock Co. said its Panama City mill, a likely destination for much of the downed timber, suffered substantial damage. The paper and packaging firm is working to get the line that makes facing for corrugated cardboard back to full production by mid-November. It will be at least six months before its pulp production is back to capacity. Undamaged mills, on the other hand, may already be fully stocked from the summer logging season. “We’re hoping they’ll be considerate and take as much of that damaged wood as possible,” said Dana Stone, an Alabama Forestry Commission official. Even as new trees get planted, the storm could leave lasting scars across the rural landscape. This one really hits home to our family as my dad and uncle assumed my grandfather’s 360 acres of slash and longleaf pine close to the creek down 253 in Seminole County. 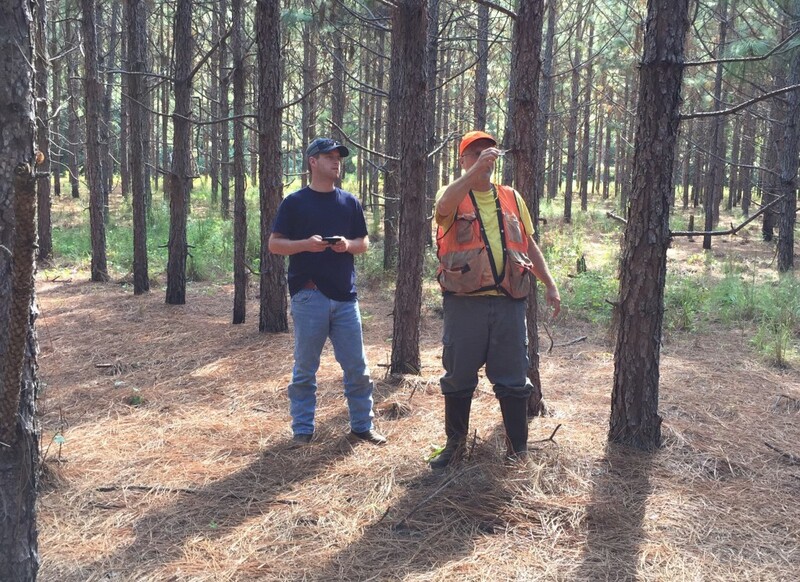 My mom took this picture of me and my dad on September 25, 2016 where Daddy was determining the need for thinning in this stand of slash. Had no idea that in two years all of this would be gone. My dad and uncle went to see it knowing what they were going to see, but it was so much different once they saw the devastation. Basal area of slash pine in Seminole County, GA on September 25, 2016. This stand was thinned in 2018 ahead of Hurricane Michael. Over 90% of this 360 acres was lost to the hurricane.